Build any single story floor plan from $97.00 Per square ft! APPROXIMATELY $35.oo per sqft less than industry standard pricing! below pricing is for a single story ranch style contemporary pitched roof home build witHin a 30 mile radius from downtown tucson BUILT TO OUR STANDARD SPECIFICATIONS. please contact us for pricing to build 2 story homes and areas outside of a 30 mile radius of downtown tucsOn. CLICK HERE FOR A FEW POPULAR FLOOR PLANS. IF YOU’RE INTERESTED IN A HOME AROUND 2,500 SQUARE FT, CLICK HERE TO VIEW THE 2561 MODEL! add $3,900 to home build for building plans and locks in PROMOTIONAL pricing for, up to, 6 months. $99.00 PER Sq. Ft. 1,551 to 2,30o sq. ft. INCLUDEs A FREE garage, up to, 576 SQ. fT.
$97.00 per sq.ft. 2,301 AND up. INCLUDEs A FREE garage, up to, 576 SQ. fT. GARAGE garage note: garage incentive includes UNFINISHED garage interior. add territorial exterior upgrade for only $2.00 per sq.ft.! Price Bond shall lock in the promotional pricing for, up to, 6 Months. Click here for information regarding great financing options! ClICK HERE TO VIEW A FEW OF OUR POPULAR FLOOR PLANS! NEED LAND OR FINANCING? CLICK HERE TO REQUEST INFORMATION! 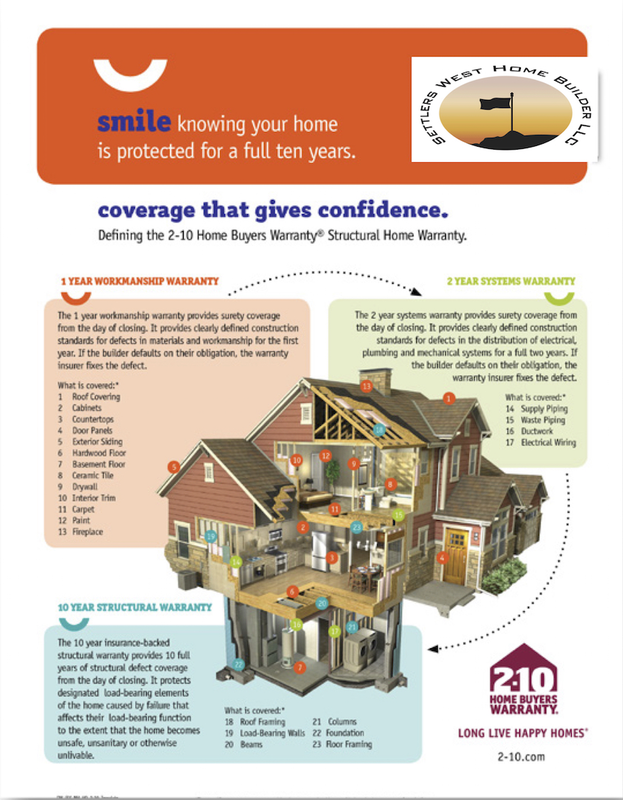 With our Home Warranty Coverage, rest assured, you're working with a Builder you can trust. Settlers West Home Builder LLC has built a solid relationship with our home suppliers and Crew Members who are all prepared to go the extra mile to ensure that our workmanship is of the highest quality and save you APPROXIMATELY 30% less than industry standard pricing. WE'RE COMMITTED TO SAVING OUR CLIENTS MONEY AND SIMPLIFYING THE HOME BUILDING PROCESS. SAVE approximatley 30% off industry standard pricing when building any SETTLERS WEST HOME BUILDER FLOOR PLAN. OR, Build your CUSTOM FLOOR PLAN concept, TO OUR SETTLERS WEST HOMES BUILDER STANDARD SPECIFICATIONS, starting at, AT $97.00 PER SQUARE FOOT! BUILD A FLOOR PLAN OVER 1,551 AND RECEIVE A FREE 3 CAR GARAGE! OUR EXPERIENCED IN-HOUSE DRAFTSMAN WILL HELP YOU DESIGN THE PERFECT HOME SPACE FOR YOU AND YOUR FAMILY! Settlers West Home Builder LLC allocates a Project Manager to guarantee the highest overall service is maintained throughout the home process. Simply put, Our goal is to exceed the expectations of our clients. We've included our pricing, program details, we Believe, will help you make a well informed decision. 2 X 6 EXTeRIOR SIDEWALL STUDS AT 16" O.C. 2 X 4 INTERIOR STUD WALLS AT 16" O.C. INTERIOR PAINT- BUILDER OFFERS SWISS COFFEE OR WHISPER COLOR FLAT PAINT FOR CEILING AND WALLS, ACCEPT WALLS AND CEILINGS IN WET AREAS SHALL BE SEMI GLOSS FINISH. DOORS AND BASEBOARDS SHALL BE WHITE COLOR WITH SEMI GLOSS FINISH. Plans include, up to, 576 SQUARE FT OF GARAGE SPACE- UNFINISHED GARAGE IS CURRENTLY OFFERED WITH HOME BUILDS OVER 1,551 SQUARE FEET. GARAGE FIREWALL HUNG AND FIRE TAPED TO CODE. REMAINING GARAGE SPACE IS UNFINISHED. garage promotion is being offered for a limited time AND MAY END AT ANY TIME WITHOUT NOTICE. At Settlers West Home Builder LLC, we know how important it is to keep your project within your budget. For this reason, we offer you a Builder Price Bond. A Price Bond allows our Clients to lock in the current Price per square foot for, up to, 6 Months! We simply build our home plans with the same standard specifications! Your home will include your personal touch at an affordable price. The credit process plays an important role in the home buying process and will help determine the interest rate and other loan terms that a Lender offers you. Our Project Manager can help you coordinate an appointment with a construction Lender today! It’s a great idea to find an Agent. They'll pull listings and help answer questions you may have. Making an offer and its specific contingencies depend greatly on your location and desire of the specific project site. Your Agent can obtain information that will assist you in making a sound decision. Upon making an offer on your potential project site, a site visit should be scheduled. At this time, we’ll determine any and all project improvements costs that may apply. Upon completing this task, we’ll present and finalize the contract to include all options and needed land amenities. Please note all options and amenities must be included within your final contract in order to be calculated within the overall appraisal. You're on your way to closing, also called settlement, the event that transfers ownership of the property to you. Just a few more things to learn, a few more things to do, and you're there! At this time, you’ll want to make sure the utility companies have your applications. We’ll take it from there! Before we break ground, we'll meet with you one last time to review your project in detail and answer any questions you may have. Home Building ProcessBelow is a breakdown of different phases within the construction build. Please note the time. Shaun do not include any type of scheduling delays, such as, weather, holiday schedules, revision delays, supplier shortages and any other delay that could affect the timeframe of your build. Your contract will have a tentative completion date. Please use the below information as a general guide to construction and verbal time frames to complete the required trades. Phase I – Foundation and Rough Plumbing (Approximately 6 Weeks) The site is cleared of any trees, rocks and debris. The site is leveled if necessary and the ground is dug where foundation is to be built. The forms have been built into which the concrete is poured to form the footers for your house's foundation. Rough plumbing- once forms have been built, the underground plumbing can be installed and inspected. Once rough plumbing has been inspected and approved, plumbing trenches can be covered for pre-slab work. A pre-slab inspection shall be scheduled prior to concrete pour. Upon inspection approval, concrete slab shall be poured. Please allow 7 to 10 days for the concrete to cure before framing. Foundation – The foundation is the structure that supports your entire house. Construction Hazards associated with this stage of construction: Open trenches. Loose and/or piled dirt and rock. Phase 2 – Framing, Roofing , Doors & Windows Approximately 7 Weeks) Framing is one of the most exciting phases of the construction process, but it is very important that everything and everybody be properly coordinated. • The frame is the skeleton of your home. All exterior and interior walls are in place along with the roof trusses. Windows and fireplaces are placed in the frame and the shingles or built up roofing system have been scheduled for installation. Construction hazards associated with this stage of construction: Temporary wall bracings are a bumping and tripping hazard. Exposed nails in lumber are both a puncture and cutting hazard. Stacked or unbanned lumber can be a fall or crushed under hazard. includes eye protection, hearing protection, and head protection. Tripping hazards exist from all of the excess material that may not be removed yet. Puncture hazards may exist from boards with exposed nails or rough wiring not yet secured. The finish is the skin of your home, including drywall, stucco, siding, and all major exterior and interior surfaces. All of these finishing touches really help your house start to look like a home. These steps are heavily controlled by the weather. Exterior finishes will often carry into Phase 5. Countertops and cabinets are installed. The house is painted and stained. Tile/linoleum is laid in the kitchen and bath, and any additional plumbing and electrical projects come to completion. Interior painting applied All cabinets installed All countertops installed Mirrors and shower enclosures installed Wall trim – Once the cabinets are in, the interior doors are installed and the molding around the doors and baseboards goes in. Paint – Once the molding is on, it is time to paint the interior of the house. Carpeting – Once the paint is done, carpet and tile is installed. Construction hazards associated with this stage of construction: Loose trim material on the floor (slip and trip hazards). Sawdust in the air from all of the enclosed carpentry work. Safety rails are removed from stair casings, fall hazards exist. Move In – Permitted once all above steps have been completed. It's exciting to see a new home take shape. We understand that our customers generally like to visit the site and we don't discourage them from doing so. However, since the workers on site may not understand the full scope of the project, it is important that you direct questions and concerns to your Project Manager. Your Project Manager is responsible for your project; therefore, he or she needs to direct the on-site personnel. You will be provided with all the necessary phone numbers to stay in touch with us throughout the process. Upon completion of your project, your Lender will order the final appraisal to confirm the completion of your project and the County/City will issue a Final approval status. Once all finds have been disbursed , you may move in your new home! concerns to your Project Manager. Your Project Manager is responsible for your project; therefore, he or she needs to direct the on-site personnel. You will be provided with all the necessary phone numbers to stay in touch with us throughout the process. Safety Considerations Keep older children within view and younger children within reach, or make arrangements to leave them elsewhere when visiting the site. Do not walk backward, not even one step. Look in the direction your are moving at all times. puncture wounds, or other injury. Do not enter any level of the house that is not equipped with stairs and rails. Give large, noisy grading equipment or delivery vehicles plenty of room. Assume that the driver can neither see nor hear you. Do not walk under workers (i.e. roofers); tools or materials will sometimes be accidentally dropped.